Women surfers are tackling both big waves and barriers in their sport. The nonprofit founder and director recently swam the English Channel. More and more women are heading up legacy companies. With an idea for a handmade cracker, this fashion entrepreneur wound up starting a popular bakery-cafe. Could the Japanese art of tidying up help teens focus better, sleep more deeply, and feel less stressed? Working in the art world today means navigating an ever-changing landscape. 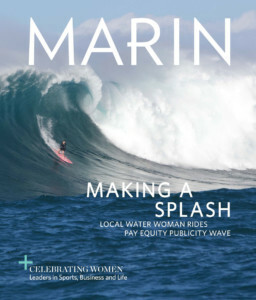 Keep abreast of new happenings in Marin, from shop openings to wellness innovations and beyond. After a slip in 2017, Marin County has been deemed the healthiest county in the state. The artist and Marin Open Studios executive director discusses this year’s event and her artistic passions. Ever wondered what Memorial Day is all about? After the catastrophic earthquake, a group of more than 60 Chinese women and girls fled to San Anselmo. The Schurig Center for Brain Injury Recovery, founded by Karen Schurig of Mill Valley in 1985, is the only non-profit offering brain injury specific services in the community. This year’s celebration marked the 50th anniversary of the Winter Open Studios of this creative art-work space and artist collective. Around 230 guests gathered for a silent and live auction to benefit the Marin Center for Independent Living.